Creating characters who willingly alienate themselves from the rest of a society viewed as boorish, irritating, tasteless, or just hopelessly uncool is familiar territory for cartoonist Daniel Clowes. In celebrated books such as Ice Haven, David Boring, and the highly successful Ghost World, Clowes has given us characters who barely tolerate the majority of the populace to which they unwillingly have to interact with. 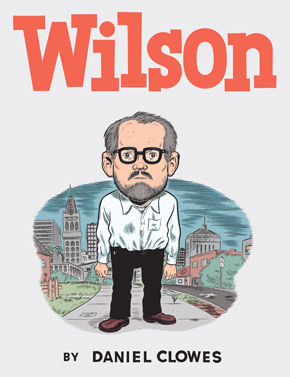 Still, even considering Enid Coleslaw (the cynical, disaffected, teenage heroine of Ghost World) Clowes has never presented us with anyone as completely acidic as the title character of his newest book length comic courtesy of publisher Drawn & Quarterly, Wilson. Wilson is a middle-aged, jobless, pseudo-elitis t, divorced man who will, without hesitation, end all encounters with others (encounters he always instigates) with biting insults and/or name calling. In short, Wilson is a complete a-hole. Told in a series of 70 single page, gag-style strips, the story of what made Wilson the bitter misanthrope that he is begins to unfold. The art style in which Clowes renders his characters varies from page to page, styles sometimes repeated, yet never in quick succession. Upon closer examination one finds that there are narrative linking devices in similarly drawn and/or colored pages that foretell, or refer back to, other sequences in the book. There is quite a lengthy paper that could be written on this complex, nearly subliminal kind of sequential storytelling, but I prefer to look at it’s attractive illustrated punch in a much more simple way: it just makes reading the book even more visually entertaining. At a recent appearance Clowes stated that his biggest influence for the creation of Wilson was Peanuts by Charles Schulz. He explained that beyond it being a strip that gave an often narratively isolated joke every day, one still felt the passage of time via seasons, holidays, and school years that would come and go. I believe that the years spanning, visually fluctuating Wilson reflects a colorful, large format, Sunday comics influence of not only Peanuts, but other greats of the news-printed page as well. Though Wilson is constantly disdainful of and disappointed by those around him he still longs for connectedness with others, primarily the teenage daughter he was previously unaware of. His attempt to get to know her leads to six year prison term for what is perceived (accurately, for the most part) as her kidnapping. Can this dour, darkly funny story possibly end on an uplifting note? Could a man like Wilson, who spends much of his time acting like an unrepentant jerk, have something that at least resembles a moment of clarity which leads to genuine happiness? This would seem at odds with much of Clowes other output, but one will have to read Wilson themselves to find out. If one is new to Daniel Clowes’ work, they may be better off starting with more accessible (but no less biting) books like Ghost World or Caricature. Still, Wilson reaches the incredibly high artistic bar that the cartoonist’s prior work has put into place. You may end up seeing a little bit of yourself in Wilson, but, for the sake of your own happiness, hopefully you don’t.